xylene is a true solvent for most alkyd and epoxy resins, it is a semi-true solvent for moisture cured and some other polyurethane resin systems and a diluent in nitrocellulose or PVB based systems, where too high a level can lead to problems. caution required here as xylene will likely dissolve the resins holding your brush together (if used). Gloves and good ventilation required as xylene has a “ modest acute toxicity” . I'm using WN #8 filbert for the experiment. Yesterday I loaded the brush with Geneva paint mixed with Liquin Original and it looks perfectly okay to use this morning about 10 hours later. Edit. At the 24 hour mark the brush was unusable. I managed to save it with multiple cleaning methods. Your method of wiping the first day and dipping into the Brush Dip when using Liquin sounds like a good one. I'll keep that in mind if I ever need to use Liquin with Geneva paints. I have only used other cleaning methods with Liquin. Maybe I'll give the Brush Dip a try with Liquin and Geneva paints. Thanks Denis. I need to be reminded of the toxicity of some of these products because I love their smell--especially Turpentine and Liquin. Xylene is a ring hydrocarbon in the Aromatics family with toluene and benzene. it is one of the most flammable solvents and a depressant of the central nervous system (CNS). small doses over a prolonged period cause diminished faculties and may lead to blindness. Skin contact de-fats the tissue and prolonged contact causes dermatitis and similar issues. inhaling the fumes is a popular but dangerous way to get high. The permanent effects on a person are the same as those who habitually sniff glue. While on the topic of resin bonds, just a tip I picked up a few weeks ago. I have known for a few years that a shot of compressed carbon dioxide will freeze shrink a hot glue gun bond to the point that the parts separate. Handy for disassembly of temporary or trial projects. However, an even more convenient way to break a hot glue joint is a spray of isopropyl alcohol. Works like a charm. I guess my summary comment about Liquin and Meglip, all of which I now have in my alchemy cabinet as of today, and use with other brands of paints and experimental art works, is that I cringe at the thought of using these products with Geneva paints. I understand the need to do so to meet deadlines and so forth, but when I see masterpieces of work created here on DMP ruined of archival potential, I want to cry. It's the mixing of the varnish contained in these products with oil paints that means they cannot be restored in the future as they age. 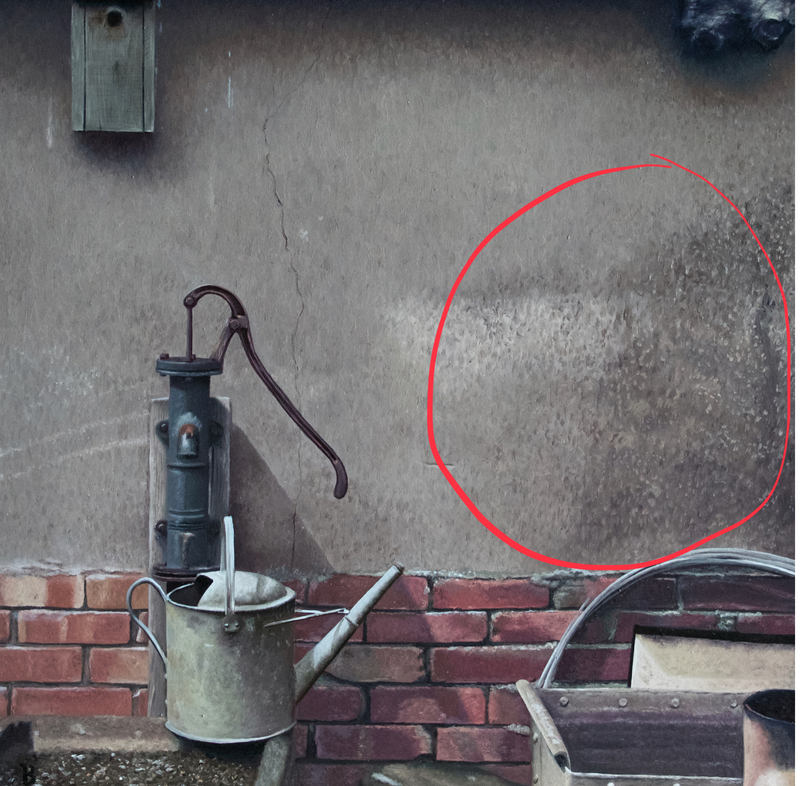 Mark's original medium recipe purposely does not contain varnish and where I first learned about this pitfall to creating archival paintings. Now, here we are, adding varnish to Mark's brain child by using Liquin and Meglip and destroying archival potential. I will probably, just the same, give it a try with Geneva. It's the adventurer in me. Just saying the word Meglip out loud makes me laugh. I just saw this, @PaulB. It's wonderful. Reminds me of a still life by Wyeth. Love the subject. And the abstract pattern made by the items and the way they all fit into the composition is beautiful - yet it doesn't look staged, it all looks natural. Well done! I'm selecting my next big picture, although it is not as big as before at 32" x 24" (81cm x 61cm). This is proving to be very difficult, as I have four images I want to paint, but I'll need to focus on one if I want it finished within six months. I think I'll end up painting them all. 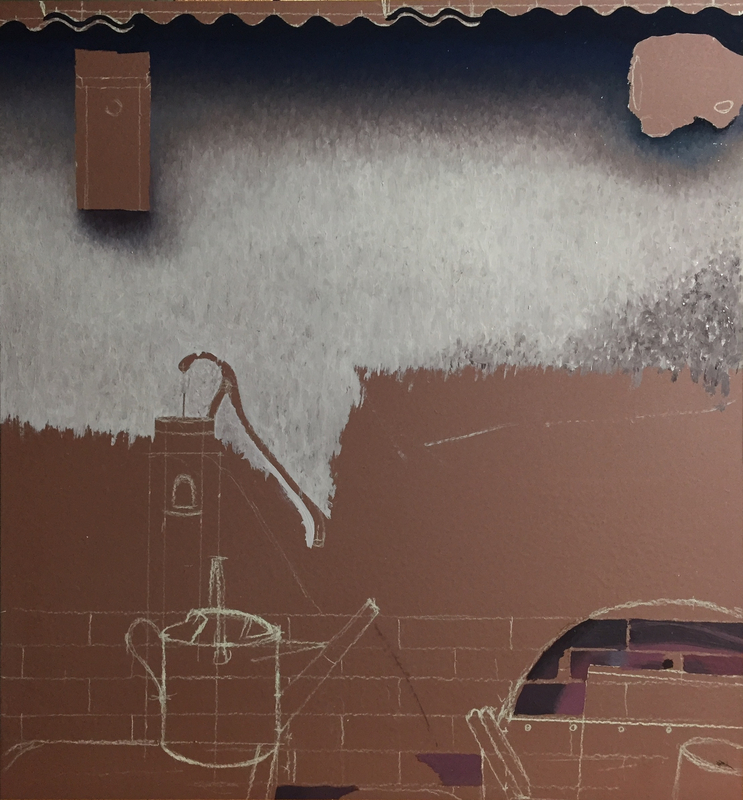 I'm conscious about choosing a first painting that is not wall-to-wall detail and complexity to do first. I've narrowed it down to another old photograph my father took as the first one while I figure out how to do the others well. This one has everything I fear in it - figures, ellipses, transparency, glass, fabric, clouds, patterns, and lettering - it could not be more challenging. I'm working on the drawing now. I look forward to watching it develop. Just attended the reception for the "You are Here" exhibit in which Cinque Terre is shown. I heard some nice comments. It was fun. Good! Has it sold yet? @Richard_P no, it has not. Several pieces have, based on the red dots that I saw. They definitely deserved to be sold. As both the only realism piece with the highest ticket price, it doesn't look likely to me. I guess I could. You have lots of new (steaming) land for sale now, right? Drawing complete, just waiting for my color-corrected printout and I can start painting. Meanwhile, heading out to a wildlife sanctuary to get some photographs on this beautiful day. Just learned that my easel is almost ready, looking forward to that. I'm looking to make some progress on my Local Landscape Challenge painting. 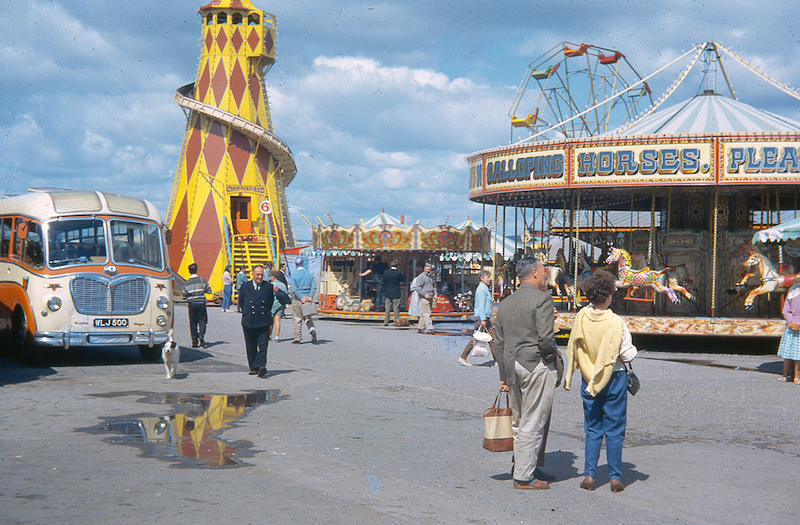 It's a 1962 shot of Weymouth Funfair, England, from my parents honeymoon. They are not in the shot. I find it happy and nostalgic, consisting of nothing but challenges for me. I expect it to be very difficult. The only part of this painting I am confident about painting is the ground. 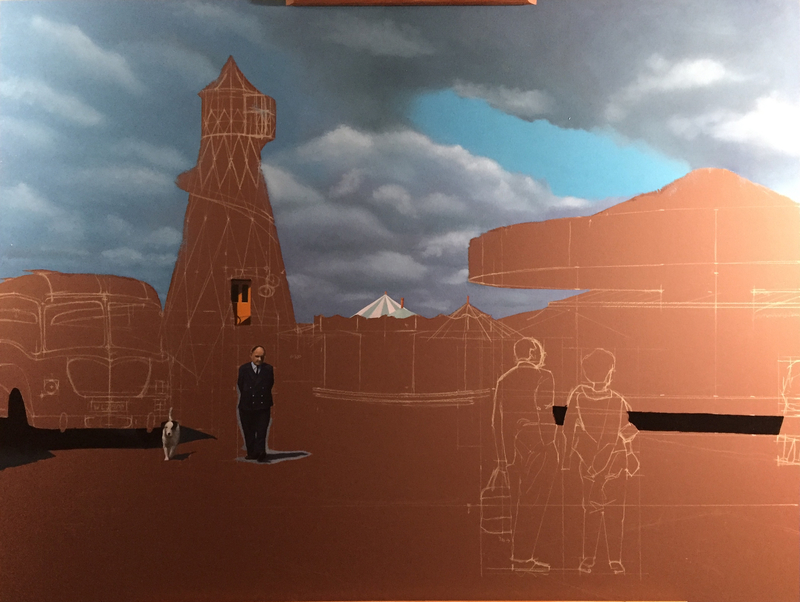 I am extending the top of the photo up 10% to both achieve the 32:26 ratio and add the top of the Helter Skelter. I have found postcards of this site that show the missing top, which I will use. My thinking is that at 32" x 26", it is half the size of Cinque Terre, which is a quarter of the surface area, which I hope translates into 2.5 months or less to paint. We shall see. I start today. Edit: It's half the width, same height, so that's half the surface area, and therefore 5 months. Oops. Forgot to answer the question: Yes, there will be a selection of brushes used on this one, but mostly the rigger brush. It's my favorite. Second, OMG, are you afraid of nothing, man!? she exclaims, wide-eyed, and ends with a loud guffaw. I don't like liquin and avoid it as much as possible, as I do all alkyds. I just don't trust the archival quality of them. I don't even use the alkyd paint to stain canvas any longer since Mark now has a good oil stain. I am even replacing my palettes with new ones backed with the new stain. No smell, no lung damage, no damaged brushes. We spend a lot of time talking about alternatives to the DMP method, and as an inveterate tinkerer I appreciate it. But in practice, I follow the workflow, and am happiest with the results when I do. @paulb, this is a great subject. I really look forward to seeing it develop. I love this picture. It's unusual of my father to compose something so beautifully, you wouldn't believe how many photos of donkeys he took. On the contrary, I'm afraid of painting everything, but I'm going to do it anyway. Otherwise I'll always be afraid of painting a carousel. Note that this picture contains nine galloping horses. Beat that, @JessicaArt! I don't like the shiny surface Liquin leaves behind, the yellow tint, or the odor. I have used it for glazes though. What do you use for glazes? Thanks. This is the simplest of the four I intend to do. The glaze mix depends on the layer. Early its 3:1 turp to linseed. Then 1:1. Finally 1:3. It works really well. I follow Icoung's formula and I rarely use Geneva paint to do it. I use turp rather than OMS because it is tree sap, not petroleum. It has stood the test of time. I use linseed instead of stand oil because the interim layers are too shiny. They have to be deglossed before the next layer goes on or you get puddles where the glaze does not stick. Stand oil is great for the last layer. I use varnish to get shine. I don't want shine until the last step. Great picture. Have you tried removing the puddle in photoshop and seeing if that helps or not? @Richard_P yes, i covered it with my hand, if that counts. I think the composition could be improved by removing the puddle, especially if I also remove most of the bus. But I'm looking to challenge myself with the painting more than I am the composition. It's another practice painting, and I've never painted a puddle. Keep the puddle it makes it real and not just a post card. At least there won't be any boats in it. I like the bus too. That really puts it in the time perspective. The composition is fine the intersecting fine lines of carosel background and ferris wheel would challenge me but not you. You have the eyes and the riggers for it. Great colors too. I think you could do this in less than 3 months if you wanted to. Great job Paul, that's really amazing work. Nice project @PaulB. Good idea to extend the top of the frame and to stop the tower being cut off. I like the puddle, and especially the reflection. In fact i'd be tempted to extend it it bit more towards the viewer + the couple, so the eye flows a bit more continuously from tower to bus to puddle to couple to horsies. I have witnessed paint leveling for the first time. I painted the whole sky in one sitting, using paint fresh from the tube and a larger brush. I just haphazardly slapped on the paint, making sure there were no ridges, and then went over it quickly with a badger blender brush. It was all brushmarks. Woke this morning to a smooth surface. I have never seen this before. Then again, I have never painted half a panel in a day. I have some black paint that always squirts oil out of the tube, so the chemistry has changed. It didn't level at all. I suppose you need fresh paint, that has not sit on the palette for a week, has not lost its oil, and a soft brush. Interesting and informative. That sure is a faster way to do it. I painted a dog, in a semi-loose fashion, and I'm not going to go in and change it. I like it, although I am tempted to mess with it. I like your semi loose dog too. He / she has a nice off balance sense of movement. 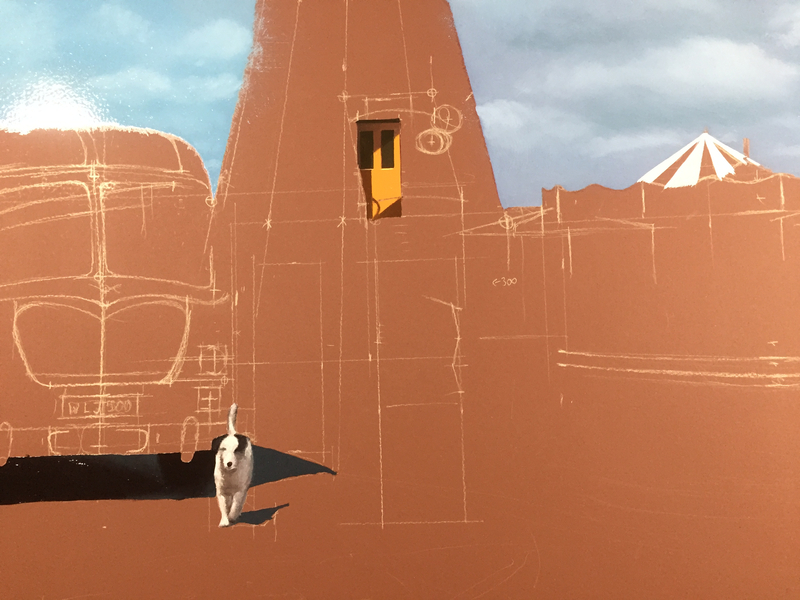 The dog (and the door) are great, the values look perfect! I think this shows it's just a series of small brush marks. Is that what you meant? Yes I meant this part. I find myself have difficulty to paint texture. I have also difficulty in another my painting with weave texture. Tha’s Why! There is one "average" color for the whole wall, which I painted. Then over that, I added a lot of slightly darker brushstrokes. I just kept adding them until it was dark enough. When I went too far, I started adding back the average color. I don't know how to paint texture either. But according to Mark, you just introduce noise of some kind, and if the colors are right, texture will emerge. I relied on that. That’s right. If the colors are right, texture will emerge. I guess I need more patience. Thank you! Better bring sink terror with you. @PaulB your painting is so excellent. I just love it. That birdhouse is so real looking. Thank you @Ronna, it was a fun one to do and I'm pleased with it. Really enjoying drawing this one, although I haven't had much time to work on it. I'm not happy with my clouds, but I think I finally figured out why - I'm missing some of the harder edges in the transitions between light and dark, closer to the horizon. I just keep cherry-picking fun things to paint or draw. This is the most casual painting I've done. Looking fabulous already, @Paul_B. Love the composition. It looks fabulous already and I am so pleased you are truly 'enjoying' the process, you sound relaxed and confident and ready to kind of try different things? I have no credentials to even comment, but I agree with you about the clouds. There are hard edges to the cloud between the tent and the carousel. I'm not sure I understand the blue sky as in the photo it appears to be a very small break in 'cloud' which allows us to see a hazy blue sky. The biggest challenge with clouds I think is to avoid repetitive forms. On another note, did you see the first video Mark made re: @BOB73's comment above? It sounds like Mark is very enthusiastic about this new venture, kind of puts wind in his sails so to speak. Your works would be splendid for this type of new outlet! Thanks @tassieguy, I like the composition too, I didn't even crop it, my father did all the work. Thanks @Renoir. I'm going to add in some more cloud edges I think. The large blue area is because I saw on the photo that there was a good blue area with a lot of dark wispy cloud in it. I just didn't add that cloud yet. I just stopped doing the cloud work when I realized something was wrong. If I had just copied the existing clouds, it would have been better, but I tried to "make up" the sky myself, with the same feel, and that's where it went wrong. 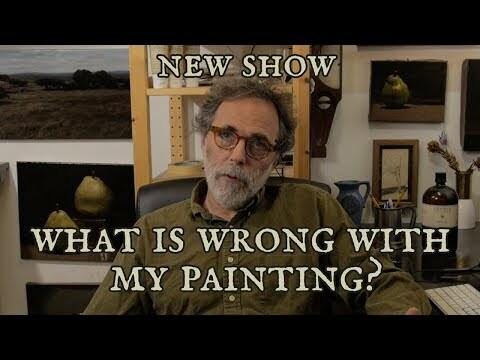 I did see Mark's new critique video, I look forward to seeing more of them. I think Adam came away from that with some good guidance. I did volunteer for that, as I'll be in the studio anyway, having a few small paintings with me. Mark said maybe if we have time. That's when I selfishly suggested @MikeDerby choose the same week, if possible, so I could maybe meet him and see his work in person.